Home / Unlabelled / 2019 General Polls: APGA Gears For Big Surprises, Upsets. 2019 General Polls: APGA Gears For Big Surprises, Upsets. With the coming general elections, history beckons again on the resurgent and rebranding All Progressives Grand Alliance (APGA) under the creative leadership of its national chairman, Dr. Ozomkpu Victor Oye. It is yet another opportunity for the Party to extend dominance in its traditional forte, the South East, and to impact further round the country as the Party continues to make surprising inroads. Proving most bookmakers wrong while asserting itself as a National Party, unlike regional parties that have risen in the present dispensation, APGA has won various seats in many unexpected States in the country – all over the South East(as expected) and in the Niger Delta, Lagos, Niger, Zamfara, FCT and in some others. That is the stuff national political parties are made of. Posterity beckons yet again with the forthcoming general polls, which holds the promise that the Party would impress even more with the new opportunity. In past elections, with its modest but widespread electoral victories, APGA has fairly and commendably commanded national appeal to emerge today as the 3rd force in the nation’s democracy. At the (first) legislative elections that the Party ever participated in, held on 12th April, 2003, APGA won only 1.4% of popular votes and 2 of 360 seats in the House of Representatives and no seats in the Senate. But progressively, in the 2011 legislative election, the Party won a seat in Senate with Chris Anyanwu and more recently, Chief Victor Umeh also won as Senator on the platform of APGA. The Party however now parades many more House of Reps members and numerous members of States’ Houses of Assembly. The Party also has in its kitty Local Government chairmen and Councilors of the entire 21 LGs of Anambra State, one in FCT (Gwagwalada Area Council), elective positions in Lagos, Niger, Zamfara and in many other places. Since its formation in 2002, APGA has steadied itself as the 3rd Force in the nation’s democracy by improving on its strings of successes in every election. It has won the Anambra governorship upon entry into the election contest fray in 2003 with Peter Obi, and since then, has held sway in the State, retaining the governorship in all successive elections despite determined onslaughts by opposition Parties in the State to dislodge the Party. APGA won the Imo State governorship as well with Owelle Rochas Okorocha who later decamped to APC 5 years ago when the legacy Parties coalesced as APC to wrest power from Goodluck Jonathan and the PDP. APGA adherents in Imo know that this is another opportunity to reclaim the Douglas House. The Party is heading to this epic battle with Senator Ifeanyi Ararume, a political battle-toughened veteran who has played the big turf and has the requisite capacity. Though pitted with gladiators like Senator Hope Uzodinma of the APC, former Deputy Speaker, Hon. Emeka Ihedioha of the PDP and not forgetting the incumbent Governor’s protégé, the governorship candidate of the Action Alliance (AA) Uche Nwosu; Ararume is believed to have an edge, riding on the wave of his own time-honoured pedigree and APGA as an indomitable brand in Imo and the South East. APGA has great candidates in Anambra too. For the Senate, Senator Victor Umeh who became an instant hit when he joined the Senate is one of them. Though Victor Umeh joined the Senate barely 6 months ago, he has pushed at least 3 intervention motions in the Senate where many more Senators who have been warming seats for years have no single motion or Bill to their credit. Return of Victor Umeh would have been fairly easy were it not for the candidacies of Senator Uche Ekwunife who Umeh displaced in the Senate, following her ouster by the courts. Uche Ekwunife of the PDP is such a formidable opponent that one only ignores to his own peril! There is yet another no mean contender, Barr. Tony Chukwuelue, once the senior legislative aide to Senator Annie Okonkwo. Chukwuelue of the SDP was recently adopted by some key stakeholders in the Anambra Central, thus throwing him up as a major contender. Despite the threats of these two gladiators, Victor Umeh still appear to have an edge. Anambra South Senatorial District has littered 4 upbeat billionaires and top political heavyweights, namely: Dr. Ifeanyi Ubah of Young People Party, the incumbent, Senator Andy Uba, his brother Chief Chris Uba of the PDP, and the APGA candidate and veteran, Evangelist Nicholas Ukachukwu. Any of the 4 has the capacity to spring surprises in that order though the backing of the Governor is an additional factor weighing heavily for Ukachukwu. In Anambra North, APGA is more assured, the senatorial district being the home of the Governor and the Party’s candidate, Chinedu Emeka, a onetime Minister of the Federal Republic, equally has his name to flex but the incumbent Senator Stella Odua of the PDP to contend with. Most seats for the House of Reps in Anambra House of Assembly and House of Reps too are likely to be clinched by APGA and quite a chunk also in the whole of the South East. The likes of Hon. Ifeanyi Ibezi running to represent Idemili North and South Federal Constituency in Anambra State do not have many challenges. Hon. Ibezi, an incredible grassroots and strategic politician, is up against a lackluster incumbent, Hon. Obinna Chidoka and a former rep for the constituency, Hon. Charles Odedo. Another hopeful is: Rt. Hon. Anayo Nnebe, member representing Awka North and South Federal Constituency in the House of Reps. 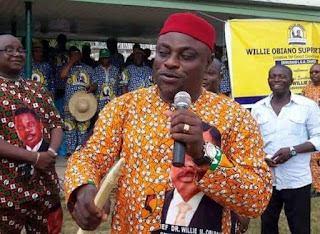 The former speaker of Anambra House of Assembly is the candidate of APGA, also only waiting for the coronation party. Enugu East presents another surprising scenario where the former Governor Dr. Chimaroke Nnamani of the Ebeano fame is pitted against the much younger APGA National Vice Chairman (South East) and Party’s candidate Chief Uche Nwegbo. The odds appear to be tilting towards APGA candidate’s favour. The youths and a wide spectrum of the Senatorial District are routing for the younger candidate. Their argument is that Chimaroke has had his time in the sun, including going to the 6th Senate where he was practically lost in the shuffles and achieved nothing. To them, therefore, time to give the younger, more vibrant candidate a chance is now and the young turk, Uche Nwegbo is primed to upstage the former governor for good reason! They have sworn not to reinforce failure by voting Chimaroke the second time. Despite the emergence of SDP and ADC and the inroads being made by the Presidential Candidate of the Young People’s Party, Dr. Kingsley Moghalu, Maj. General John Gbor (rtd.) is likely to finish a strong 3rd in the Presidential Election ahead of the three. Displacing incumbent President Muhammadu Buhari and PDP’s Atiku Abubakar is such a tall order. Lack of requisite structures and logistics, as admitted by General Gbor himself, is not likely to allow him finish stronger than the duo. Though APGA as a national Party is in the best position to articulate and advance South East regional and minority interests across Nigeria, the problem remains that Ndigbo have not been able to fully translate their love for the Party into maximum electoral support. This is another opportunity to right this wrong. Justifiably, many have expected that APGA would produce the governors of at least the 5 South East States by now. Here is an opportunity. The APGA brand must be sustained for the survival and political advancement of Ndigbo and minorities in Nigeria. APGA has to be kept alive even for the sake of Emeka Ojukwu who was its face and soul. The inimitable Emeka Ojukwu, barely 33 then, led Ndigbo and the old South East to resist extermination already being delivered to them in installments in pogroms repeatedly visited on them before the genocidal Nigeria-Biafra Civil War that claimed millions. Ikemba Emeka Ojukwu rounded off his live and defence of Ndigbo in APGA and made a last wish before he to took his glorious bow out of earthly life, when he said: “Vote for APGA, this is my last wish”. red political turf. Dissenting members should please bury the hatchet and join forces in keeping both the APGA dream and Ojukwu’s last wish alive. Gen. Gbor is solidly in the race for the Presidency of the Federal Republic. He has not and is not stepping down nor adopting any other Candidate for that matter. He s in the race to win no more no less. APGA PRESIDENTIAL Campaign DG.